sigh…..in the nicest sort of sigh way. My favorite summer read – pull up a chair! lamcal … I miss you! It seems that you are a mind reader, BAM. I have come to think I don’t have to keep a journal as I can just read yours! 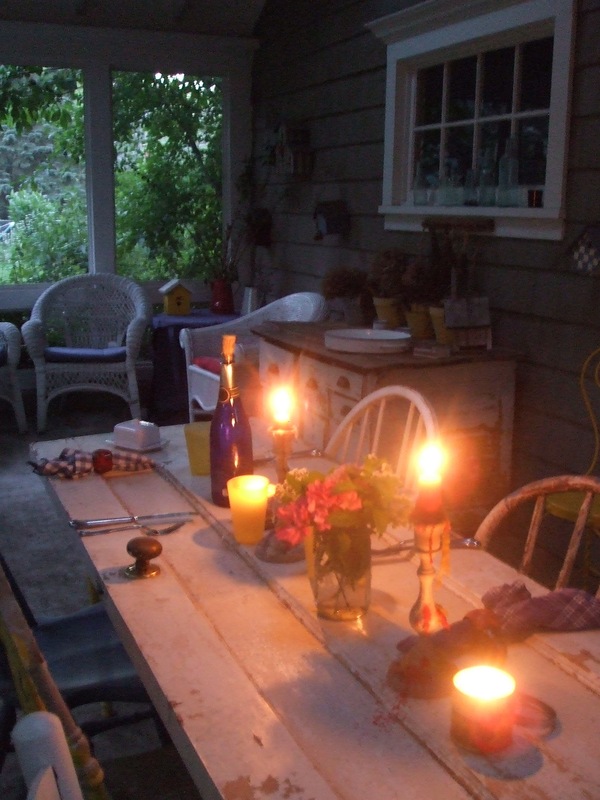 We too had dinner on the deck, with tea lights in baby food jars hanging from the cherry tree. This marked the official start of summer. After the guests went home, and the candles were out, I realized the cherry tree looks mighty fine with blossoms in spring, but never better then when filled with lightening bugs on a summer night. Thank you for the wonder and always reminding me of the many blessings…..PS. It’s your old JC friend from DC. we are shut up here in nyc, retreating from the record heat. i’m savoring your citronella tinged scene fuzzy with bubbles even more. linger a little longer out there for us. What I find most remarkable about this lovely meander is that is was the little one who “put his foot down” and insisted on the family dinner. When else but in the long and loose days of summer are our children allowed to control the schedule of days? And how wonderful for him that he has this opportunity. Life passes by way too quickly for our children. I’m betting he takes these moments with him as he grows. At our house, we eat outside every chance we get when the weather cooperates. It’s a sure sign of summer when the cheerios box finds its way to the deck. And we use the grill as much as possible for evening meals. Happy summer, everyone! oh, lordy, is there anything so fine as being holed up inside on a downpouring late afternoon and wandering over to here and heck, finding nearly every last chair at the table has been filled with the most marvelous souls…..oh, PJT, what a pure delight (and wonder of the internet) that you found this little place……and delighted us with your baby-food jar candles. are your boys all grown? oh, lordy, i can see them both in my mind’s clear eye…..and yes, JACK, how glorious that it was the little one who put his little soccer foot down. and new mama laura, who knew you could squeeze in a moment to come join our peaceful table. so sorry for your heat, baby. please do let the little one know it isn’t always quite so hades like here on the planet to which he’s just arrived….i am just fizzy with cheer to find you all here, MB and PJV and dear dear lamcal……. and couldn’t wish more mightily that there comes a day when we are all squished in out there, with prosecco flowing madly amid the stories that will not end…..